Cindy Williams grew up in a culturally rich part of New Zealand where the kids sang the songs, played the games and heard the stories of Maori. Many years later, she would hear the story of injustice suffered by the Ngati Whatua people and also of their elders who spoke about forgiveness and moving forward. It was then she knew that The Pounamu Prophecy was a story that had to be told. It is her debut novel and drew praise in the build-up to its official release, which was on 1 October. “Cindy Williams tells a story that is both powerful and sensitive. Whether it is a fracture between cultures or couples, between husband and wife or parent and child, The Pounamu Prophecy offers the reader hope,” said fellow writer Andrea Grigg, author of A Simple Mistake and Too Pretty. Veteran broadcaster, artist, poet and cultural advisor, Haare William wrote, “The Pounamu Prophecy is eminently predictive for where we as Aucklanders are re-versioning a future by rekindling some of our past sins to find a pathway that is both lasting and redemptive”. Williams weaves fiction with the gritty history of New Zealand as she tells the traumatic story of Mere who, as a child, watches the government burn her village to the ground. Years later, she visits Helene and James to finish writing her life story – one of injustice, revenge and reconciliation. But Helene and James have problems of their own. After five years together, their marriage has become dull, predictable, boring… and it starts to unravel. 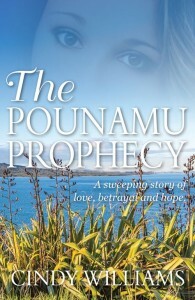 The Pounamu Prophecy explores the universal issues of injustice, love and redemption. Of how an individual or race of people deal with the pain of betrayal. Of how it can it affect physical health. And explores whether redemption and healing are possible. Williams currently lives in Sydney with her husband and teenage son. She has worked as a consultant dietitian for over 20 years and has a Graduate Diploma in Communication and a Master of Public Health.